General vehicles, 7-5 Seatbelts and seatbelt anchorages. This bulletin applies to class MA vehicles fitted with a single- (R1) or dual- (R2) sensitive retractor seatbelt in a front outer seating position where that seatbelt has failed a WoF or CoF inspection. in which the fitting of a webbing clamp seatbelt would require modifications to the vehicle structure. The seatbelts commonly referred to as ‘webbing clamp’ or ‘webbing grabber’ seatbelts have features that minimise uncontrolled webbing payout after the locking mechanism has been activated. This ensures that vehicle occupants are kept firmly in their seats in a crash. When installing a new seatbelt after the previous one has failed during a WoF or CoF inspection, a webbing clamp seatbelt is the safest option for many vehicles. 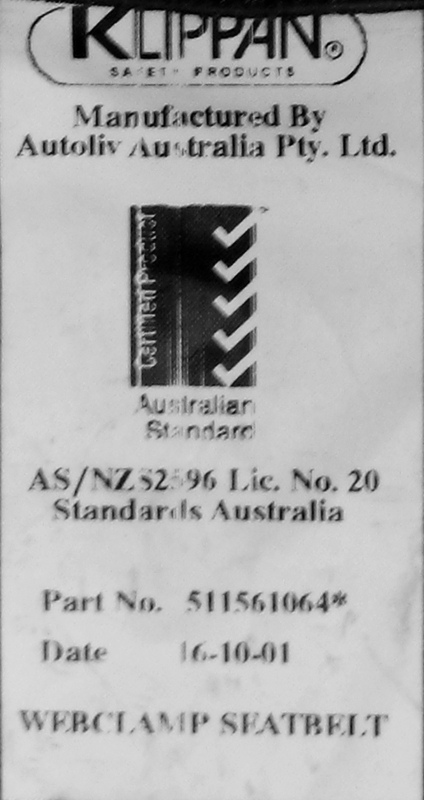 A failed type R1 or R2 retractor seatbelt in a front outer seating position must be replaced with a webbing clamp seatbelt (see Figure 5-1-1) unless a webbing clamp seatbelt is not readily available (see Note 1), or the vehicle inspector has confirmation that the vehicle is one to which this bulletin does not apply. A seatbelt is considered not readily available where, eg, an automotive parts retailer normally able to supply webbing clamp seatbelts does not currently have the correct webbing clamp seatbelt in stock and cannot supply one within two working days by courier from the parts supplier. The vehicle operator must supply proof that the webbing clamp seatbelt was not readily available, eg an invoice from the seatbelt installer or retailer. 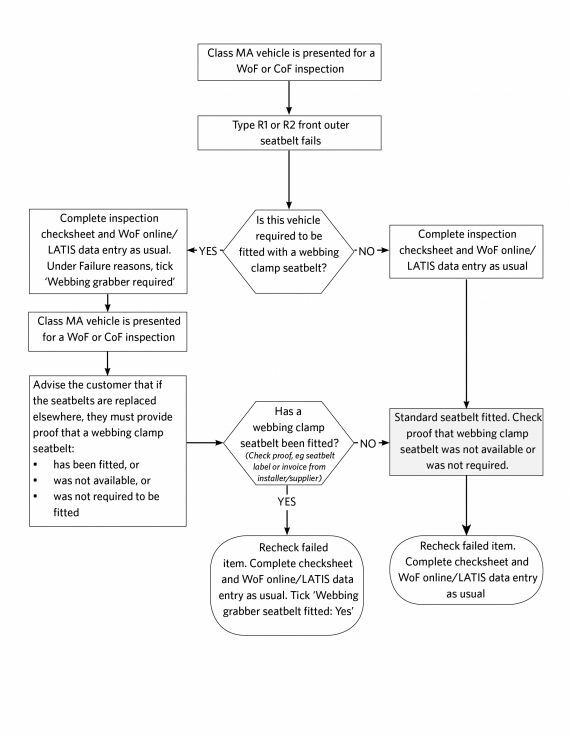 Vehicle inspectors must enter the inspection result as outlined in the flowchart in Figure 5-1-2.